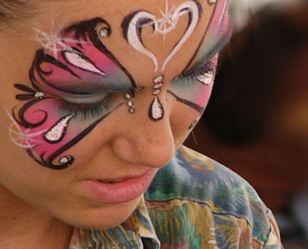 Face Painting: Face painting is always popular with children, but why not let them have more fun by getting them to also paint the adults' faces too! You'll be surprised how much fun kids can have when the tables are turned and they get to decide who'll be what! Pass the Parcel: Wrap a small gift in many different boxes and layers, each with different colored wrapping paper. The gift is passed around while music plays, and when the music stops, the child holding the gift gets to unwrap one layer. Make sure you've got more than enough layers on the parcel so that each child has a chance to unwrap at least once. This game can be made a lot more fun for everyone by hiding little party presents or coins within the layers. Make sure an adult is controlling the music. 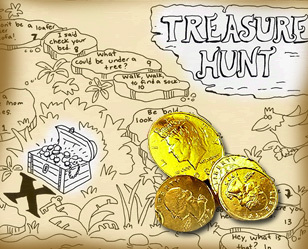 Classic Treasure Hunt: Divide kids into teams, depending on how many are at the party. Make up clues and scatter them all over the house (and outside, too, if weather permits). Each clue leads to the next and at the end of the trail is a treasure for the team, for example, food, party favors, or prizes. Hint: Color code clues so teams only find their own clues. Time the hunt and see which team gets done first. String Treasure Hunt: Take colored strings and wind them all over your property, inside and outside. Up the stairs and then back down, over and under furniture, beds and chairs. Teams must wind up their roll of string to find the treasure at the end of the roll. A fun games that kids will love, but may not work as well in households with cats (who will thoroughly enjoy the game themselves). Scavenger Hunt: Scavenger hunts are a lot of fun, and there are many variations on the idea. The key to a successful scavenger hunt is to think about who the players will be and make clues and items that will appeal to them and go with your overall party theme, if any. After you decide what type of scavenger hunt you will have, you need to spend some time coming up with a list of items to collect or activities to complete. Here are some ideas: Video Scavenger Hunt - Players use video recorders to record themselves doing the silly things on their list. When all the groups get back together, they watch the tapes. Picture Scavenger Hunt - Players use Polaroid cameras to photograph the crazy things on their list. Neighborhood Scavenger Hunt - Players go out on foot in your immediate neighborhood to find the information or items on their list. Mall Scavenger Hunt - Players are set loose in the mall to gather info or free items like brochures (no purchases should be required).